NXP estimates RFID CARD about 100 million cell phones to be shipped with NFC in 2012, according to Alexander Rensink, director of strategic marketing for NXP’s identification business unit. Put it another way, nine out of the top ten smartphone vendors are shipping NFC-enabled devices and NXP supplies eight out of the nine. The result is 90% penetration for NXP in NFC-enabled mobile handsets. Rensink describes the market this way: Between 2011 and 2016, 2.2 billion NFC-enabled devices will be shipped and the largest sector by far will be handsets. NXP already has NFC chips designed into 200 smartphone models and tablet computers and only about 80 of them (40%) are in volume production, Rensink said. The big driver for NFC-enabled mobile phones is the prospect of using the cell phones for transactions. But Rensink believes there is a lot more to NFC than just providing a means for transferring funds. “NFC can be used in coupling the physical world to the virtual,” he said. All this may be possible, but none of these sound like killer apps. To some extent, NFC is similar to Bluetooth, a technology standard for exchanging data over short distances. It was invented in the early 1990s by Ericsson and quickly became essential for mobile phone and eventually computer makers. So is NFC the new Bluetooth? Millions of chips shipped, but rarely to be used? NXP’s Rensink replies: “NFC does get used.” The Google Wallet initiative, which NXP contributed in 2011, has moved forward to version 1.5. “Many other payment initiatives are being trialed and rolled out,” Rensink added. “We are still in the early days” more applications are in the pipeline. 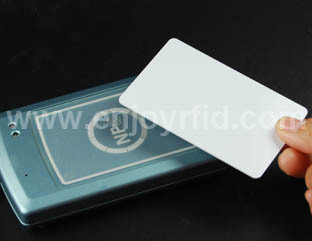 We are rfid inlay likely in the early days of a Bluetooth-style roll-out for NFC. If the technology can find a niche in the Internet of Things and wireless sensor networks, it may yet prove to be useful.